I AM DELIGHTED TO ANNOUNCE THAT I HAVE SECURED A PLACE TO PHOTOGRAPH AT THE CANON ‘SHOOT THE SHOW’ EXPERIENCE AT LONDON FASHION WEEKEND. I will be shooting The Catwalk Show from the photographer’s pit for one day, the same pit where days earlier the world’s press have been shooting London Fashion Week. 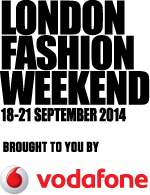 Canon UK and Vodafone have teamed up to give CPS members the chance to photograph three catwalk show at London Fashion Weekend – September 2014. A fantastic experience and I captured some great shots, the Canon team were great and provided very useful tips. Such an amazing experience for me to get the chance to do this. What a brilliant evening at London Fashion Weekend today. I was so delighted to have been able to come along I have learned so much, used settings I had not used before and now for the first time understood why some of the options are on the camera. There will be an image waiver rights form that must be signed at the One Aldwich Hotel in order to take part in this opportunity. This opportunity is not for professional photographers looking to sell their images. The images cannot be sold or distributed for sale or used in any advertising but can be shown on personal websites, blogs, etc. The Philippine Centre and TFC proudly present the biggest, grandest and most star-studded event of the year!! ***UPDATE*** – More images added!! Julia Barretto, Enrique Gil, Shaina Magdayao, Rayver Cruz and Mr Pure Energy – Gary Valenciano!! To view ALL photos from Saturday 19th July and Sunday 20th July click HERE…. 30th Barrio Fiesta sa London 2014!! To view photos from Saturday 19th July click HERE…. The Filipino Hertfordshire (Fil-Herts) Community in Stevenage is organizing the first Barrio Fiesta in Hertfordshire to showcase the beautiful Filipino culture and to promote camaraderie within the community. Photos by Enrique Guadiz Photography – Official Event Photographer. Images from the 1st Hounslow Summer Festival Lampton Park, London (Sunday 6th July) click HERE.